The 3.5mm headphone jack that has existed in audio players for 100 years is no more. Apple ditching the headphone jack had been rumored for some time, but it was unclear what the company was going to do to replace it. In part, it’s all about the lightning port—and lightning buds will ship with the iPhone. 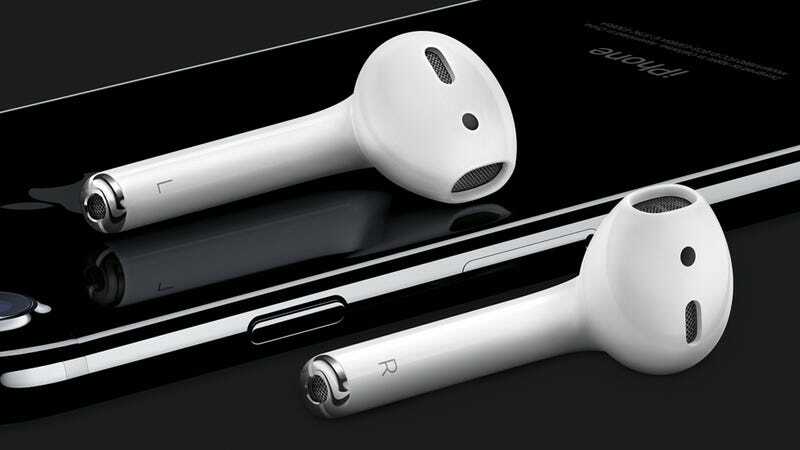 But the real future is AirPods, the truly wireless listening devices that look just like EarPods without the wires. The company’s latest phone, the iPhone 7, will use the Lightning port on the bottom of the phone, the same one you use to charge it, instead of the headphone jack we know and love. Apple will include a pair of Lightning EarPods, as well as a Lightning-to-headphone jack dongle, in the box. Apple is touting a new W1 chip that powers the AirPods, as as well as upcoming Beats headphones. The chip will supposedly improve the performance of the headphones that utilize it, but we have yet to try it out ourselves. It seems like this case included with the AirPods is essential to their use, as the case will be used to charge and carry around the AirPods. The AirPods will have five hours of charge, while the carrying case will have 25 hours. You pair the AirPods with your iPhone by opening the case to the box. They will cost $159, which is pretty reasonable as far as wireless headphones go. Apple executive Phil Schiller justified ditching the headphone jack by saying it took “courage” and that removing the headphone jack frees up space for other components in the iPhone.